Emirates Motor Company (EMC), Mercedes-Benz general distributors in Abu Dhabi and Al Ain, has teamed up with its parent companyâ€™s five-star hotel and resorts property, Al Fahim Groupâ€™s Fairmont Bab Al Bahr, to grant EMC benefit cardholders the most elite services in Abu Dhabi as well as across the world. â€œEMC is delighted to enter into this new promising business venture with Fairmont Bab Al Bahr helping us both reach our goals of offering clients distinctive value-added services. Our strong relationship will continue to prosper under this mutually beneficial agreement,â€? praised Mr. Kamal Rafih, General Manager of EMC. According to Mr. Henning Fries, General Manager of Fairmont Bab Al Bahr, â€œOur association with Emirates Motor Company is an example of a regional partnership that makes good business sense, from a brand perspective,â€? adding, â€œboth EMC and Fairmont represent quality offerings, products and genuine service, with a commitment to continued success in our respective industries.â€? such as chauffeur service and VIP treatment, at any Fairmont Hotel in the world. 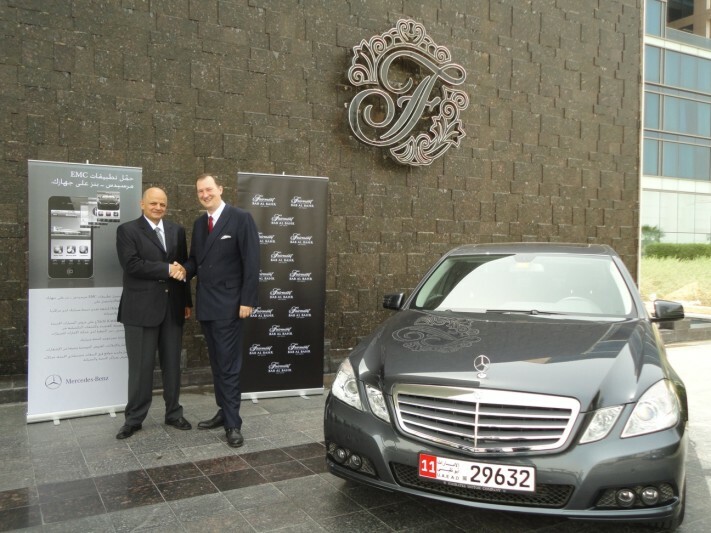 Furthermore, during the term of the agreement, Fairmont has announced that Mercedes-Benz will be referred to as the â€œPreferred Vehicle of the Fairmont Bab Al Bahrâ€? and has included a Top Clients Special Delivery Package to share in the special moment of when EMC customers receive their new Mercedes-Benz. Customersâ€™ premier experience will include discounted room rates with a complimentary upgrade (subject to availability) and a memorable dinner for two with a 50% discount at select restaurants. Other offers EMC cardholders may take advantage of at the Fairmont Bab Al Bahr in Abu Dhabi are 20% discounts on select food and beverage, spa packages including gym or beach memberships. â€œWe understand our customers and their unique lifestyles; as a result, we constantly aim to present our customers with the most superior services through the most prestigious brands in the world,â€? concluded Mr. Rafih. â€œThis new partnership program will ensure our customers receive world-class treatment wherever they go giving them the golden experience they seek whether they are driving to their destinations in their elegant Mercedes-Benz, and now, when spending a pampered weekend with the family, or even when traveling abroad.â€? As the flagship company of Al Fahim Group, Emirates Motor Company (EMC) symbolizes the phenomenal growth and success that Al Fahim has achieved. EMC houses the world's largest Mercedes-Benz facility and is synonymous with immaculate quality - in true Mercedes-Benz tradition. EMC has been the authorized general distributor for Mercedes-Benz in Abu Dhabi and Al Ain since 1962. From the beginning, dedicated customer service has played a major role in the company's success. EMC is also the first Mercedes-Benz distributor in the Middle East to be awarded the ISO 9002 certification. EMC markets, distributes and services all Mercedes-Benz vehicles, from luxury saloons to the largest trucks, and provides Mercedes-Benz qualified service with high and consistent availability of genuine parts. Innovative customer-oriented marketing programs, designed to provide comprehensive support to its loyal clientele, remain EMC's primary focus. Operations in Abu Dhabi are carried out from purpose-built premises with a well-integrated network of showrooms, offices, part depots and workshops. EMC serves a premium client segment in the region including dignitaries, the UAE government, oil companies and the business community. Moreover, EMC is constantly involved in community-drive activities that include social, environmental, charitable and sports-related. Located in world-class destinations around the globe, Fairmont Hotels & Resorts is a celebrated collection of hotels that includes landmark locations like Londonâ€™s The Savoy, New Yorkâ€™s The Plaza, and Shanghaiâ€™s Fairmont Peace Hotel. With more than 60 hotels, Fairmont is known as much for its warm, engaging service and culturally rich experiences, as its classic hotels that imbue a sense of heritage, sophistication and social importance and are often considered destinations in their own right. A community and environmental leader, Fairmont is also regarded for its responsible tourism practices and award-winning Green Partnership program. Fairmont is owned by FRHI Holdings Limited, a leading global hotel company with over 100 hotels under the Fairmont, Raffles, and Swiss?´tel brands. The company also manages Fairmont and Raffles branded estates and luxury private residence club properties.